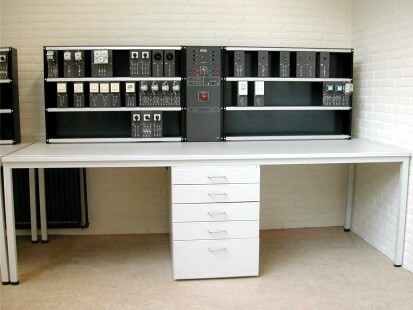 The Van der Perk practical training system is a training system for technical education, and is on the market from the year 1978. It was produced by the company Van der Perk in Rotterdam the Netherlands. 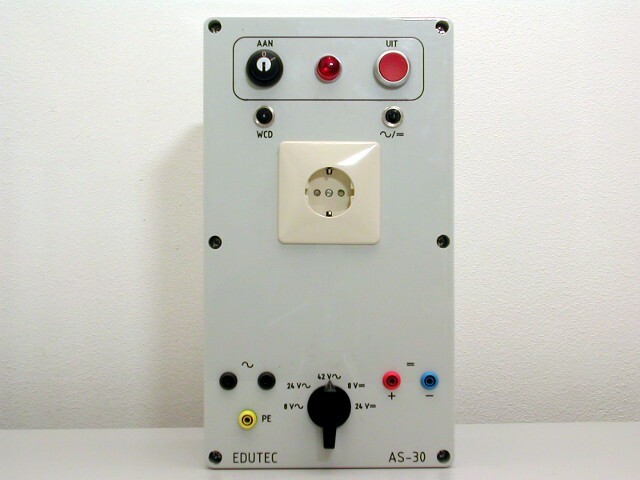 Edutec has taken over this activity in Augustus 1997, and can now guaranty the repair replacements and expansion of new and exiting training systems. The current production has been adapted to comply with the new safety standards. In the future the assortment will be expanded to installation systems like gas, water, heating and cooling. 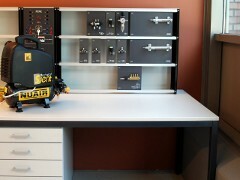 Training system tables with power supplies and experimenter racks. Beside the standard package, we can supply custom build parts and equipment. 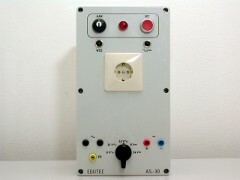 Such as cusum training panels, power supplies with non-standard primary and secondary voltages etc. 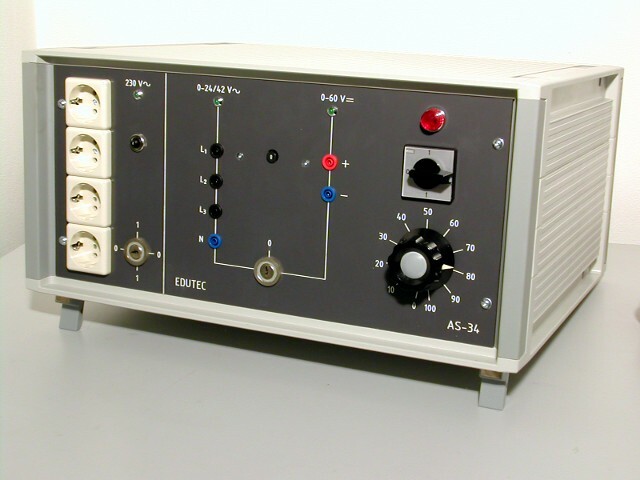 The AS34 power supply is specific for students at the VMBO level. 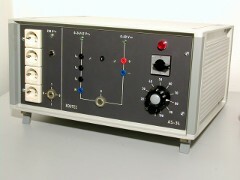 400/230V, 50 Hz, with a 5 lead cable and CEE connector. 0-40/23V, 3x8A (L1-L2-L3-N) with safety connectors. 0-60V, 8A with safety connectors. 230V, 2A with 4 electrical outlets. All voltages are equipped with current breakers. The 230V section switch is operated with a key. With the 4 electrical outlets the earth connection is connected to each of the 4 electrical outlets but not to the PE connection of the mains. The direct current section is a 3 phase rectified voltage with a maximum ripple of 4.2%. Junction box type AS30 for the mounting frame. For the testing of the exercises made by students. Apply to all necessary safety rules. Primary: 230 / 400 VAC. Secondary via WCD: 230 V - 1A. Secondary via switch: 8, 24 and 42 VAC, 4A / 8 and 24 VDC, 4A. Outputs are electrically isolated and thermally magnetic protected. For the Van der Perk training system is also a pneumatic system available including air compressor and air tubes.